Although the Toshiba TDP-FF1 uses conventional DLP technology, the light source is unusual as the lamp is LED. From one point of view, this is a good thing as LEDs have a long life of more than 10,000 hours, so this projector will never need to have its bulb changed. On the downside, LEDs have nothing like the brightness of a halogen lamp, so the TDP-FF1 has a rating of a mere 400 lumens and a projection distance range of 0.4-2.5 metres. We'd say that figure is incredibly optimistic and estimate the usable range at one metre, which gives an image with a diagonal measurement of 70cm. Image quality is fine, but the projector is awkward to set up as it doesn't have any form of height adjustment or auto keystone, and the noise level is the same as a regular DLP projector. 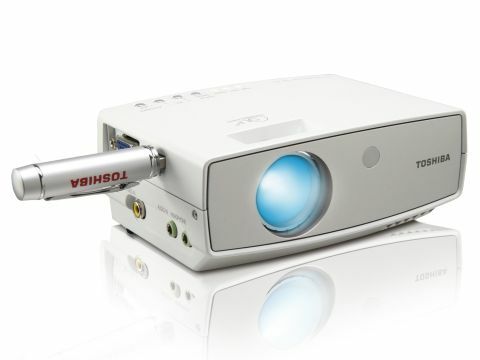 The Toshiba is a tiny unit that doesn't need its external power adapter, as it can run for two hours on the rechargeable battery pack that clips on the back of the projector body. At this point you can see the line of thinking: mobile workers might find themselves without mains power and urgently need to give a PowerPoint presentation, and while their laptop can run on battery power the same isn't true of projectors. To this end Toshiba has packed the TDP-FF1 into a relatively large bag, which includes a fold-out silver screen that measures 57cm on the diagonal. It's a bit like taking a baby on your travels, as the kid is tiny but the associated paraphernalia takes up more room than an adult. If you do ever find yourself stuck without power, you'll find it far more convenient to simply huddle your audience around the screen of your laptop.